New Year’s Resolution: Learn Quick Search! If you’ve been at ISU for a while, you’ve probably noticed that the Library website no longer has a traditional library catalog. Instead, there’s a new search tool called Quick Search at the top of the home page. If you’re a faculty member, student, researcher or a member of the ISU community, the New Year is a good time to level up your Quick Search skills so you can get the most out of Quick Search, and also know when it’s best to use a different search tool. Hey, it’s just a search box. It can’t be that complicated! No, it’s not complicated if you’re searching for just anything – but for library research, that’s rarely the case. The first thing you need to know is that it’s really worth your time to use one or more of the 3 drop-down menus (shown above) that are located just below the search box. The choices listed in these drop-down menus help you focus your search. Why spend time plowing through thousands of results if they’re not what you need? The second thing you need to know? 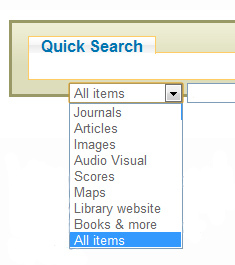 Quick Search lets you search far more than would a traditional library catalog. We’ve opened up drop-down menu #1 here, so you can see all the types of materials you can find with this tool, including Articles, content located on the Library website, images, and a lot more. That’s why it’s a good idea to always take a few seconds to focus your search. Just type your search terms in the box, then choose the relevant selection(s) in one or more of the drop-down menus, then click the Search button. You’ll have your focused results in a fraction of a second. Third thing: In general terms, Quick Search connects to various indexes and databases and allows you to search their contents seamlessly, without ever leaving Quick Search. Nice!! This can be a huge time saver. But, if you’re doing research on race & ethnic studies topics, get ready for the shocking news! Most subject-focused indexes that focus on race and ethnic studies research articles have NOT been “connected” with Quick Search due to software incompatibilities. This means you’re probably not searching the best or most comprehensive collections of research articles in these subject areas. Yes, you may find some interesting articles and information, but you’ll definitely need to go directly to indexes like Black Studies Center, Bibliography of Native North Americans, Ethnic NewsWatch, Hispanic American Periodicals Index, Chicano Database, and others to make sure you’re choosing the best tools for a thorough, scholarly and comprehensive search. It’s a good strategy to use Quick Search and subject-focused indexes to ensure you’re getting everything you may need. Do start exploring the drop-down menus and some of the many fun features of Quick Search, such as creating your own account, tagging, and reviewing materials of interest. It’s a great way to start the New Year! This entry was posted in African American, American Indian, Asian American, Finding, Gender, Latino, World and tagged databases, ethnic studies, libraries, race by biblionotes. Bookmark the permalink.